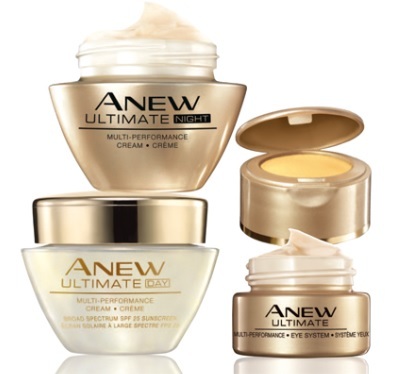 Discover the gold standard in anti-aging with Avon Anew Ultimate Multi-Performance! Avon Anew Ultimate Multi-Performance offers a line of luxurious skin care products formulated with the exclusive celluvive complex to virtually transform the look of multiple signs of aging for 10 remarkable results including: smooth texture; skin clarity; even skin tone; fine lines and deep wrinkles look reduced; moisturization; natural volume; resilience; reduced look of discolourations; firmness; and lifted looking skin. Day Cream Broad Spectrum SPF 25 - 50g - $39 - moisturizes while protecting skin to prevent further signs of aging due to sun exposure. Night Cream - 50g - $39 - with an ultra-moisturizing formula designed to make skin look like it has new life come morning. Eye System including 15g Cream - used twice a day and 2.5g Elixir - used in the evening with the cream - $39.